Matt Farah and the crew from The Smoking Tire just can't seem to get enough of the 2011 Ford Mustang Shelby GT500 Convertible they had for this year's Bullrun. With the cross-country party over and nothing but a mountain of citations looming in the distance, The Smoking Tire set out to give the big Blue Oval one last goodbye. Of course, they couldn't spend an entire episode pouring over every last detail of a vehicle that regular viewers know all too well. Instead, the show lined up a quick stint behind the wheel of the Classic Design Concepts Firebreather. 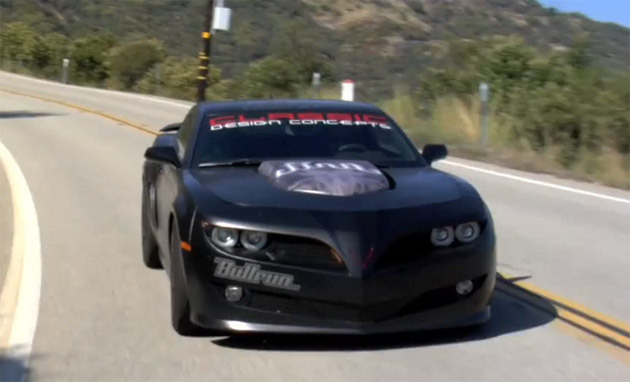 Think of it as what the 2010 Pontiac Firebird would have looked like if the Poncho had survived the GM apocalypse and the company's designers had been on acid. If you can get past the wildly rear sheet metal and the drooping front fascia, there's a supercharged version of the 6.2-liter V8 in the Chevrolet Camaro on which it's based. The whole concoction is good for 600 horsepower, and while the car was originally worked up for an Exodus Productions movie, Classic Design Concepts will be selling genuine Firebreather models to the public. Hit the jump to see Farah wrangle the car through a canyon or two. Video: The Smoking Tire gets to play with the Firebreather originally appeared on Autoblog on Fri, 30 Jul 2010 18:57:00 EST. Please see our terms for use of feeds.